Overview You might Vanabode to Alaska but you have to take a floatplane here. They just drop you on the lakeshore. Typically For the next two weeks you will survive using the skills, gear and luck you came with. This is a vast wilderness. It is absolutely full of wild animals, big insects, crazy weather, rocky colorful ridges, glacier carved valleys and fragile plants and seasonal blooming flowers. You can hike or boat float through greatly intact ecosystems where people have lived with the land and on the land way before the United Sates was founded. 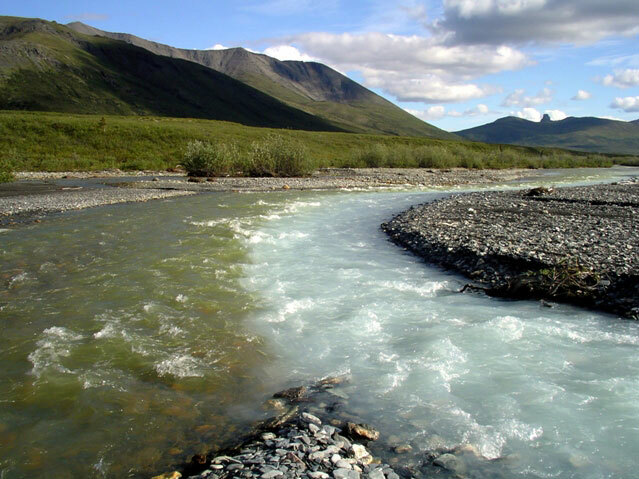 Picture of a clear stream merging with a glacial stream in the Noatak River drainage in Gates of the Arctic National Park and Preserve in Alaska. Outdoor Activities include boating, floating, hking, biking (though not recommendeed) fishing, limited hinting with special permits, photogpahy, star gazing, filming and more. The Gates of the Arctic National Park and Preserve is located above the Arctic Circle and far from any roads whatosever. Nearly all visitors come to the Park by flying in a bush plane based out of local villages. Some hike into the wilderness from the Dalton Highway or Anaktuvuk Pass village. This is too much for me but I may try it one day, right now I am sticking with places I can Vanabode right to. 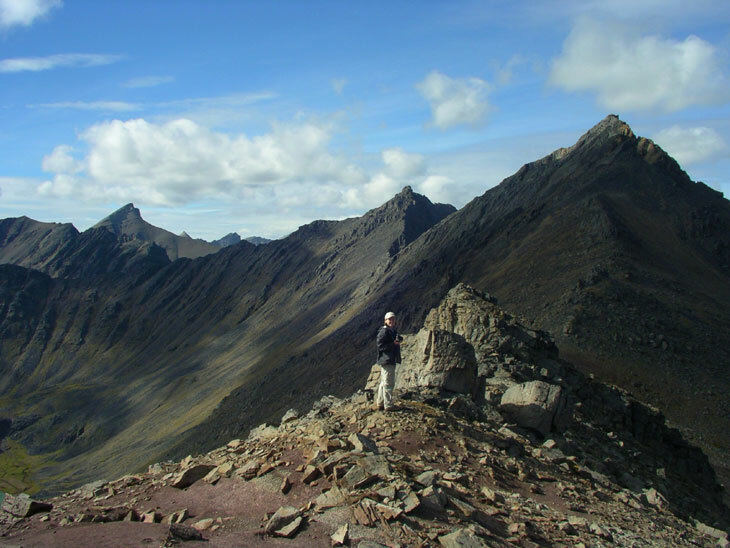 Picture of hiker at the Brooks Range which divides the continent north and south in the Gates of the Arctic National Park Alaska. This is not a recommended hike alone so hopefully he is not using a tripod to shoot this but rather a friend. Camping There are no designated campsites in Gates of the Arctic National Park and Preserve just like in most of the other Alaskan parks. Camping here in the arctic calls for serious planning and prep work in order to protect both the visitor and the fragile arctic ecosystem. Select a durable surface for your campsite. Gravel bars work well, but be sure to camp well above water level. There are times when the rivers rise very fast. When camping on the tundra, select a site that is not too dry and that will not be heavily impacted. Do not trench for tents or cut foilage. When you set up your campsite, keep in mind that you are in bear country. Locate your cooking/eating area 100 yards away from the sleeping area. Stash all your food, trash, petroleum and other odorous items (toothpaste, lotions, etc.) in a separate area. Before you leave return your campsite to it's original state as if you had never been there. 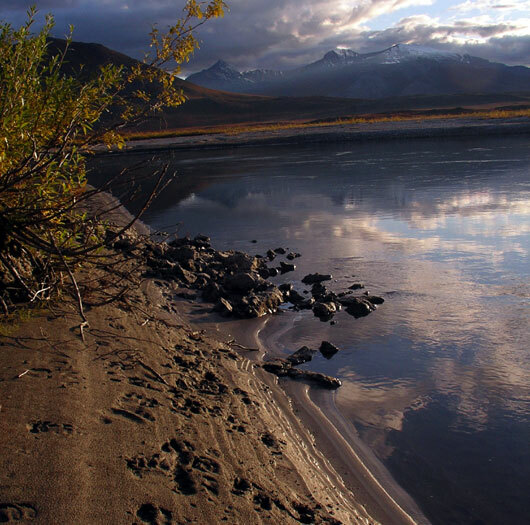 Image shows fresh grizzly bear tracks along the river. If you do encounter a bear while hiking do not run. If the bear has not seen you then quietly detour. However, if the bear is aware of you but has not acted aggressively then back away slowly. If a bear stands up then it is to identify you and is not necessarily threatening. Speak in a low, calm voice while waving your arms slowly above your head. Keep your backpack on at all times as this can protect you if he does attack. Defensive aerosol sprays containing red pepper extract have been used as an alternative for protection against bear attacks. Birding Because of its endless summer sunlight, Gates of the Arctic National Park and Preserve is the summer destination of many migratory birds. In addition, there are a number of year-round residents such as the ptarmigan. A total of 145 species of birds have been observed in the Park and Preserve over the past 30 years. Aquatic birds, raptors, song birds, and many others can be seen and heard. Bird watching is a common activity for hikers and boaters in the Park. Others will find opportunities for bird-watching in Bettles, Anaktuvuk Pass and Coldfoot, as well as all along the Dalton Highway. 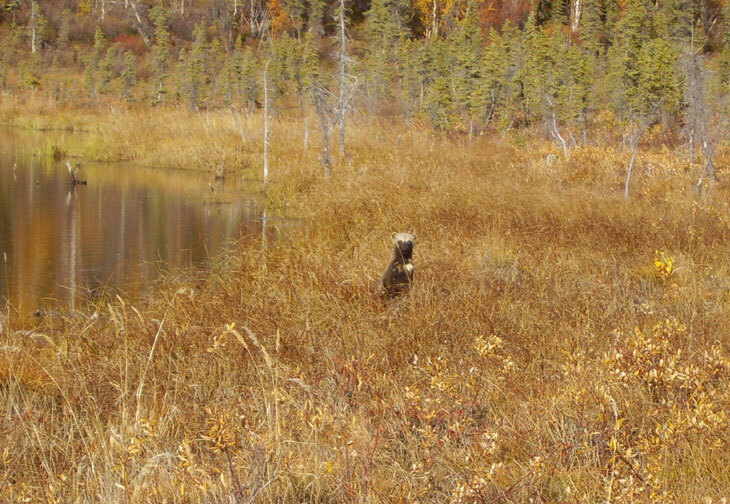 Picture of a curious wolverine peaking over the tall grass in Gates of the Arctic Alaska. Birding Tips: Nearly half of the birds recorded in Gates of the Arctic live and nest in water related marshes, lakes, rivers and streams.. Birds are most active in the early morning and early evening. Remember the sun never sets in the summertime. This can make for some counfusing time scedules to see wildlife. Obviouslsy the more you are out the more you will see. 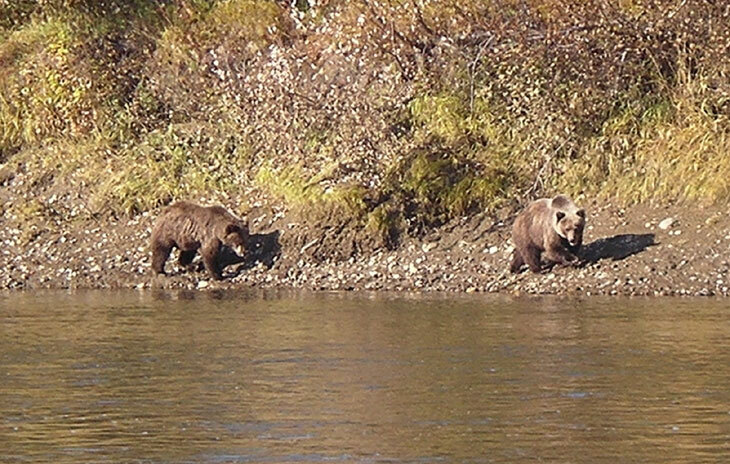 Picture shows two grizzly bears hunting for fish along the river bank in Gates of the Arctic National Park and Preserve in Alaska. This would be a situation where you are too close for comfort and should quickly move on and find a better safer vanatage point. Vanabode Special Notes: Even though Alaska can be extraordinary and Vanabode offers a very safe. cheap way to get startede I still cannot recommend this destination. It is too rugged and too wild and the inclement weather can be devastating. If you do travel during the warm months do some heavy planning and research so that your van is outfitted for Alaska's extreme temperature swings, rain and bugs in Gates Of The Arctic National Park & Preserve Alaska.